"I'm Guinan. I tend bar and I listen." Working in a bar is never easy. You have to deal with lowlifes, drunks, soldiers who will harass the female entertainment and some of the clientele with their better armed arsenal, and the average Joe who confesses his life problems to you as you pour him another round. This is the life of the Bartender: he pours a round and just quietly listens and observes the setting. Unless, of course, he's asked for advice. Just how valuable this advice might be depends on the story, but when you're desperate and maybe a bit drunk, it might seem like a good idea. Expect him to hear "I'll Tell You When I've Had Enough!" pretty often. The real weirdos will be the ones who get Drunk on Milk. Depending on the setting, this character may also be a Knowledge Broker, as alcohol tends to loosen lips. They may take up the duty of a quest givers in any fantasy (or science-fantasy)-themed Tabletop Game. Many bartenders are known only by their nickname. Also often afflicted with Obsessive-Compulsive Barkeeping. Blueno took advantage of this as he disguised himself as one for several years to find any information about an ancient warship. Makino owns a bar in Fuusha village. In Ghost in the Shell: Stand Alone Complex TV series, one of the Major's underground contacts is a bartender. Bartender, predictably, is an anime centered around a Bartender, his bar and the stories of its patrons. Mirajane of Fairy Tail is this for the entire guild. Whenever he's not out on a mission, Kurogiri from My Hero Academia runs the small bar that serves as a base for the League Of Villains. Meliodas of The Seven Deadly Sins is the owner of the Boar Hat bar. Escanor is also the owner of a bar called "The Sweet Gluttony", and he pulls off the stereotypical bartender look better than Meliodas too. He even gets assigned as the Bartender at the Boar Hat when he rejoins the group. Andrew Gilbert "Agil" Mills from Sword Art Online runs a bar in Tokyo. His wife runs the place during his absence, and after the titular game is cleared other players frequently visit the bar, especially the main characters. Izumo Kusanagi in K, right-hand to the Red King, and owner and bartender of Bar HOMRA, the Red Clan's headquarters. While he does play a more involved role in the story, he is often seen behind the bar, making drinks, etc. He also usually has that bartender sensibility about him, whatever he's doing. Pokémon has a G-rated version in the episode "The Forest Teacher", an Oranguru that lives up to the species' name of "Sage Pokémon", somehow dispensing advice to humans despite the Pokémon Speak (well, it is a Psychic-type, so maybe it's somehow making its meaning known without actually speaking), treating their wounds if needed, and serving up Pinap Juice. At the center of the Criminal universe is Gnarly, the ex-boxer who runs The Undertow, a dive bar frequented by crooks, con-men and people who just plain run out of luck. Like most bartenders, he has seen and knows a lot more than he lets on, and is extremely judicious in applying it. A Nice Guy bartender shows up in one story in Preacher and ends up helping Tulip's best friend with some sage advise while she's feeling down about her (lack of a) love life. And then, because this is a Garth Ennis comic, we get a hilarious (for us, not for him) story about how he ended up chemically castrated after he got mistaken for a child molester by the police. Kadies in Sin City usually has waitress Shellie in the role as an earpiece as evident by Dwight's background confessions seen in many stories. Her (and Kadie to a lesser extent) seem to be able to get Marv calmed down, no easy feat. Blurr ends up as this in The Transformers: Robots in Disguise. His bar is a general hangout for anyone willing to not shoot the other customers, Autobot, Decepticon, or neutral. In The Transformers: Windblade, the title character goes here to get information on Starscream. Swerve in Transformers: More than Meets the Eye finds a bar aboard the Lost Light and promptly claims it as his own. Later issues establish it as one of (if not the) most important places on the ship. Tapper Smurf, the Oirish proprietor of Tapper's Tavern, in Empath: The Luckiest Smurf. Interestingly, his name is a Shout-Out to the arcade game Tapper. He also is a Friend to All Living Things replacement for the adult Nat Smurf in the stories adapted from the cartoon show that originally featured the character in that state prior to his being a Smurfling. The Infinite Loops: In the MLP loops, once Big Macintosh starts Looping, he takes to building a bar for other Loopers, giving them a place to help cope after harsh loops, as well as just giving them a place to hang out and share stories. Other Loopers have since followed his example and set up bars in other Loops. In Nosflutteratu, when Twilight goes to Sugarcube Corner for advice, she discover's Pinkie has adopted "Sympathetic Bartender" as a persona. Kurt Bright in Storms Overhead, who goes undercover as Kurtis, acts as one in the Charming Faeries Inn. It helps him with information gathering, as he exploits the fact that bartenders might be able to get people talking once they've gotten drunk. The bartender from Tapper plays this role in Wreck-It Ralph. Cheech Marin plays the surly, toothpick-chewing bartender of the local Bad-Guy Bar in Desperado. He didn't even have a name; he was just called "Short Bartender." Danny Trejo tended bar in both From Dusk Till Dawn and Anchorman: The Legend of Ron Burgundy. The roles wouldn't be that noticeable if they weren't being played by DANNY FREAKING TREJO!!! Brian Flanagan (played by Tom Cruise) learns the fine art of bartending from Doug Coughlin (Brian Brown) in Cocktail. The extremely creepy Lloyd of the extremely creepy Overlook Hotel in The Shining. Joe in The Sky's the Limit, who is addressed in the movie's Breakaway Pop Hit, "One For My Baby (And One More For The Road)." In Keeping the Faith, the Framing Device is the priest (name?) "confessing" to The Bartender. In Bunraku, Woody Harrelson's character is a bartender who goes simply by the name The Bartender. The Fifth Element. Priest Vito Cornelius is shown pouring out his sorrows at a bar. The Reveal Shot shows the bartender listening to this drunken spiel is a faceless android. John Woo plays one in Hard Boiled to give Chow Yun-fat's Cowboy Cop 'Tequila Yuen' advice. He mentions at one point that he also was a cop. Anatomy of a Murder has Alphonse Paquette, bartender of the Thunder Bay Inn and one of the witnesses to the murder of Barney Quill. In I Shot Jesse James, the bartender in the Creede Hotel is the one who proposes John Kelley become Town Marshal for Creede, and gives Kelley the badge when he accepts the job. Lily from Petticoat Planet runs the Venus saloon and tries to keep the peace between the mayor and the sheriff. Thierry Delasix runs a "Tavairn" out in the jungle that Kyle keeps running into. Desmond might actually fit a bit better into this trope, as he runs a place with drinks and dispenses wisdom to the hero at an opportune time. The fact that it's an espresso cart has nothing to do with it. Justin Callahan of the Callahan's Crosstime Saloon stories by Spider Robinson. "Mac", who runs MacAnally's in The Dresden Files. MacAnally's is one of few places which is neutral ground for supernaturals, so every non-"vanilla human" in Chicago will drop by sooner or later. He doesn't talk much, though. Larry Niven's Draco Tavern stories are told from the perspective of the human barkeep to an alien Bar of Weirdos. Harry Potter: Aberforth Dumbledore, the barkeep and innkeeper of the Hog's Head introduced in Order of the Phoenix. Theres also Tom of the Leaky Cauldron introduced in Philosophers Stone and Madam Rosmerta of the Three Broomsticks introduced in Prisoner of Azkaban. The Ship Who Searched by Mercedes Lackey has a scene where the male lead pours out his woes to a bartender and receives some good advice — along with a Lampshade Hanging, as it's revealed that a lot of bartenders in this future setting have received formal training in psychological and relationship counseling because of how often they're in scenes like this. In The Shining by Stephen King, Jack talks with Lloyd the bartender, someone he knew before coming to the Overlook, but in this particular case, it's actually the Overlook serving as bartender. Xavier runs a bar in Lonesome Dove. In The Lord of the Rings Barliman Butterbur hands down private letters among some of his customers and shares with them important information. Though he sometimes errs in giving advice, Gandalf trusts him and makes him his deputy Quest Giver. In Soul Music, Hibicus Dunelm, proprietor of the Mended Drum, knows what the routine is when a solitary figure is Drowning His Sorrows. Unfortunately, he tries it on Death, and the resulting conversation leaves him rather uneasy. Mr Cheese, the owner of the Bucket, the Watch pub in Men at Arms is described as a good listener. He listens to things like "another beer" and "keep them coming". And he knows what to say: "Certainly, sir" and "Credit? Of course!" The bartender at the bar where Silverfish, Detritus and Gaspode are drowning their sorrows in Moving Pictures, on the other hand, has learnt it's best not to say anything. "It may never happen" or "It could be worse" don't go down well with his clientele, because it has and it was. In Witches Abroad, this is strictly enforced by Lilith - any bartender not round, red-cheeked, and jovial, willing to listen to the cares of the world, quickly loses his liquor license. Igor, mine host at Biers, has to cater for the drinking needs and variant temperaments of a supernatural and undead clientele. The Star Wars short story Last Call at the Zero Angle has Florn, a former TIE pilot who had to retire after a crash left him mostly a cyborg. He now runs the Zero Angle, a bar that serves as a hangout for off-duty TIE pilots from both the navy and army, which leads to frequent fights he has to break up. Notably, the pilots from both branches respect him due to the huge number of hours and kills he racked up as a pilot. A Star Wars Legends example is Memah, one of the POV characters in Death Star. Journey to Chaos: At Full Mug you will find Rab who is both the owner and operator. He'll listen to whatever problem you're having while brewing up some of his taverncraft and give advice as necessary. You don't even need to be in his tavern for the first one; if he sees you on the street it's the same deal. In Mana Mutation Menace, he listened to Eric's girl trouble (failed attempt at a Relationship Upgrade), Culmus' girl trouble (complicated Uptown Girl situation) and Basilard's girl trouble (his clan is rejecting his adopted daughter and she is rejecting them as well, including Basilard himself) but only had sage advice for the latter. Dan Shamble, Zombie P.I. has Francine, middle-aged human bartender at the Goblin Tavern. Although no Unnatural herself, she's been through so many hardships and bad decisions in her own life that she has no difficulty commiserating with her monstrous clientele's problems. Katrina "Kat" Williams is one of these for the Silver Bullet in Newshound. Since the Bullet is the only bar in Phoenix catering exclusively to werewolves and other shapeshifters, Kat tends to know most of the local gossip, and isn't afraid to share it. The Big Bang Theory: Invoked Trope in one episode. When Sheldon sees Penny working the bar, he expects her to act like the typical bartender, pouring drinks in which he can drown his sorrows and offering him sage advice. Buffy the Vampire Slayer: In "Beer Bad" Xander gets a job as bartender and looks forward to acting as The Confidant to pretty girls, only to get run off his feet and insulted by arrogant frat boys. When one pretty girl does look ready to pour out her troubles, Xander brushes her off because he's too busy worrying about Buffy getting plastered with those same frat boys. He ends up quitting his job in a huff just because the owner brewed up some cursed beer that turned those drinking it into Neanderthals. Some people just can't be satisfied. Cheers: Sam Malone not only tended the bar, he owned it. At least for a while. Both Woody Boyd and Ernie "Coach" Pantusso worked as bartenders at the Cheers bar as well. 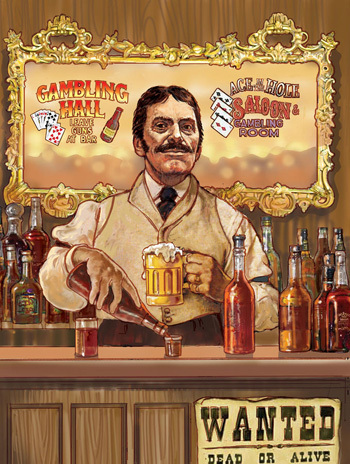 Deadwood: Al Swearengen tended the bar, when he wasn't being the town's crimelord. Eastenders has The Queen Vic(toria) pub, which is basically the centre of Albert Square. If you run it, you're in charge of the square. Usually, bad things happen to you, too. Several characters fight for the title King/Queen of the Vic. Ezel: Bade Uysal is a female example. As manager and bartender of Vur Kaç, she is always ready to lend an ear, becoming a trusted acquaintance to many of Ezel's friends. Life on Mars (2006): Nelson is an oracle nonpareil who may just be the protagonist's subconscious. He's also a Fauxreigner in that he plays up a Jamaican accent so people don't take him too seriously ("Folks just seem happier with the other Nelson"). He turns up again in the very last episode of Ashes to Ashes (2008), which reveals (MAJOR spoilers): that he's more or less the British coppers' equivalent of St Peter. The Love Boat: Isaac "your bartender". Always willing to lend an ear. Revolution: In the pilot episode, Miles Matheson, at first, until Charlie Matheson came looking for him. J.D. 's slacker brother, Dan, was mentioned as being a bartender. In one episode, we see JD and Turk flamboyantly mixing drinks at a bar, complete with tossing the drinks in the air and catching them in the glass. JD: Last summer, Turk and I had to choose between working disaster relief or going to bartender school. I like to think we made the right choice. Star Trek: Deep Space Nine: Quark. While more self-serving than the average example, he genuinely enjoys talking to people and getting to know them, and laments turning down a more profitable career as an Arms Dealer due to it being impersonal. Oh, and amoral. Quark: Don't call me "Barkeep." I'm "your Host," a sympathetic ear to serve you drinks at a... reasonable price. Star Trek: The Next Generation: "I'm Guinan. I tend bar and I listen." Star Trek: The Original Series: In the original pilot "The Cage," the Chief Medical Officer, Dr. Boyce, has a drink kit to use when he wants to get a patient of his to open up. As he says "Sometimes a man will tell his bartender things he'd never tell his doctor." Boaby the Barman at the Clansman in Still Game. It's not clear if his surly attitude is the cause or result of the constant abuse he gets from the clientele. One sketch in A Bit of Fry and Laurie involves a bartender that manages to simultaneously offer his customer advice and bar snacks through a Hurricane of Euphemisms. Fry: Good juicy tongue in the back passage! Daredevil (2015): Josie is a bartender in Hell's Kitchen who Matt and Foggy have helped out on numerous legal issues. Matt, Karen and Foggy in turn hang out at the bar after work to play pool and have drinks. Jessica Jones (2015): This is how Luke Cage gets introduced, running his own bar in Hell's Kitchen. It's a low profile job that allows him to stay off the radar as he's an escaped fugitive from Seagate. He loses the bar after Kilgrave makes him blow it up. Luke Cage (2016): Since the whole saga with Kilgrave, Luke has moved uptown and now works nights as a dishwasher at Harlem's Paradise. In the first episode, he is pressed by the kitchen manager into bartending because Dante, the regular bartender, has called in "sick" to go help his friends Shameek and Chico rob a gun deal between Cottonmouth and Domingo Colon. During his shift, Luke ends up meeting Detective Misty Knight, who is there undercover to watch Cottonmouth. Luke exchanges witty banter with Misty and eventually entices her into having a one-night stand with him in his apartment. At one point, Luke and waitress Candace Miller also have to deliver some expensive Ace of Spades champagne upstairs to the private box where Cottonmouth, Mariah Dillard, and Domingo are officially sealing the gun deal that Dante and his boys are robbing. Toby Keith's song "Hope on the Rocks" is from the point of view of a bartender who acts as a confidante for all those who come to drown their sorrows. "The Wishing Well" by Trent Willmon is a similar storyline to the above song. The Thrilling Adventure Hour's "Sparks Nevada" segments feature Barkeep, who deliberately leans into all this trope's associated stereotypes (until he doesn't). Barkeep: I don't want no trouble in my place! Our Miss Brooks: In "Babysitting New Year's Eve", Mrs. Davis has a friend who's a bartender. She invites him over to prepare the punch for her New Year's party. Mrs. Davis' bartender friend is allowed New Year's off as a condition of his employment. The reason? The bartender hates drunks. Nick, owner of Nick's Pacific Street Saloon, Restaurant, and Entertainment Palace in The Time of Your Life. Bye Bye Birdie has Charles F. Maude of Maude's Roadside Retreat, Sweet Apple, Ohio. The bartenders in the Quest for Glory games are usually of the rough, shady, and not very friendly variety. Probably a member of the Thieves' Guild. Pretty much a given, since the Thieves' Guild is under the bar in game 1, in game 2 the bartender is a minion of the most prominent criminal in a corrupt city, and in game 5 the entire bar is owned by that same person; there aren't any taverns in games 3 and 4. The Legend of Zelda: Majora's Mask has Mr. Barten, the keeper of the Milk Bar in Termina. Telma in The Legend of Zelda: Twilight Princess owns the aptly named Telma's Bar, which is a fairly important area for the story. The Legend of Zelda: Breath of the Wild has Furosa, the proprietor of the Noble Canteen in Gerudo Town. A Turian bartender in the Dark Star lounge lampshades the advice-giving portion of the Bartender trope; if Shepard attempts to milk him for gossip, he suggests you ask around before commenting that he doesn't get "why humans always ask him that." Another lampshade is hung by Aethyta, the Asari bartender on Ilium, who turns out to be a Matriarch. When the character asks what she's doing tending bars, when Matriarchs are supposed to be councilors and figures of wisdom, her reply is, basically, "that's why Matriarchs make the perfect bartender." The third game reveals that she's Liara's father (no, not her "other mother", her father) and was keeping an eye on Liara's intel-broker activities for the other matriarchs. She moves to a bar on the Citadel once the Reaper war starts. In Omega, a Batarian bartender tries to poison Shepard, but since this is Shepard, he fails. Shepard can then either force the bartender to drink his own poison, get a paranoid turian to shoot him or tell him to scram. He's promptly replaced by a salarian. Dutch, who runs the Vortex on the Nexus is a subversion. He doesn't want to be a bartender. The Vortex was meant to be a science lab, but some people realized it'd make a pretty swell bar, gave him the equipment to make it one, and he's been reluctantly mixing drinks For Science! ever since. After Ryder shows up, it becomes clear as much as he complains, he's starting to get into the bar scene. Umi Hemon, the owner of Kralla's Song is another subversion. She hates being a bartender (why is she a bartender, then? Don't ask), and is pretty rude toward customers, at the best of times. Except Drack, having taken on the challenge of trying to make a drink that'll actually work on him. The elderly and professional George Watstatt from Reality-On-The-Norm, sometimes replaced by the young and eager Dave Nihilist. K from Shin Megami Tensei IV, a former a Samurai commander, became this upon retirement. He mellowed out, but he still helps out the new generation by managing Challenge Quests and, as per trope standard, advice dispenser. The Wild West chapter of Live A Live has one, of course. His main purpose in the game is to waste time: you get eight minutes to set traps to hold off the Crazy Bunch gang, and if you're done early you can have a drink to pass the time faster. While he has a story to tell, he keeps getting sidetracked telling it and it goes absolutely nowhere. Podley from Paper Mario: The Thousand-Year Door fills this role quite nicely, being the bartender in the appropriately named Rogueport. He's essential to recruiting one of the members to your party much later in the game. The protagonist of Va 11 Hall A is a bartender of a tavern set in a Cyberpunk dystopia. Her job is to not only keep her clients properly liquored up, but also converse with them and give them advice. Escape Velocity often mentions bartenders in the Flavor Text of the spaceport bars where you can pick up missions. Dragon Age has a few. None of them are of the advice-giving persuasion, but they all have their own relevance to the plot. In Dragon Age: Origins, there's Lloyd, the owner and bartender at the tavern in Redcliffe. The player, if their persuasion skill is high enough, may force him to participate in the defense of the village instead of hiding out in the cellar getting drunk. In the city of Denerim, the unnamed bartender at the Gnawed Noble Tavern can be approached for some off-the-record side quests which are not precisely legal. The owner of the Spoiled Princess Inn, on the docks of Lake Calenhad, needs the player character to stop asking nosy questions because his family is under threat of murder. Naturally, the player helps him get out of trouble. In Dragon Age II, the bartender of the Hanged Man is called Corff. Instead of advice, he offers gossip when asked, and some of it is incredibly funny. In the first part of Dragon Age: Inquisition, the bar in Haven is run by a sweet woman called Flissa. Her major involvement with the plot is needing to be rescued from the burning bar when the village is attacked. When the Inquisition settles in Skyhold, she's replaced as bartender by a taciturn dwarf named Cabot. When asked, Cabot will comment on his training, the general mood, and random things he's overheard from the patrons — all delivered in the same deadpan tone. This is a possible background for the Player Character in Unavowed. Appropriately, choosing it also means that you gain access to certain dialogue choices that centers around being a trustworthy and likeable person who has an easier time getting people to open up to you about what troubles them. In The Elder Scrolls V: Skyrim, each tavern and inn has a non-generic NPC filling this role. Beside selling food and drinks, they can be asked for rumors (sometimes related to local quests) and work (official bounty hunting quest). In The Bug Pond, a bug named Raspberry runs a juice bar where Flash goes to express his woes. Crystal of Sluggy Freelance hosts the bizarre cast of the comic in her bar, always ready to comfort them with a smile and a free drink she mixed herself. For your own safety, do NOT try her experimental cocktails. Darin of Wapsi Square is the wise, almost fatherly variety. Here is his introduction. Bacchus, the protagonist of Nectar of the Gods, is this kind of character, who tends to the bar giving characters advice and serves them a perfect cocktail to soothe their troubles, and practically every other character in the comic is a bartender as well. Kendrion from Even In Arcadia spends time pouring his rejected heart out to a barmaid who ends up giving him advice. Eric Patterson, from Our Little Adventure. In Far Out, one appears behind the bar as the character walks in. Inhuman Relations: Slavko the bartender is always ready to dispense wisdom to his patrons. And someday, he just might have some wisdom to dispense. In Tower of God, one of Hwa Ryun's jobs is being the clerk in a karaoke bar. This role is filled by siblings Bart and Carrie Enderson. Ironically, they're both Secret Keepers to two mercenaries that despise each other. There was also an unnamed pirate bartender who appeared in Greybeard's flashback. Dominic of Video Game Confessions is this. It's not easy for him, because the bar in question is mostly visited by troubled Video Game Characters. How To Hero mentions a bartending superhero who believes that sometimes supervillains just need someone to listen to them while they wipe they same spot of the bar with an old rag over and over again. Futurama has a robot named iZak work as a bartender at times, parodying Isaac from The Love Boat (see Live-Action TV). In Bravestarr, Handlebar was the resident bartender in New Texas. He fought more than he listened, though. Horace, from Family Guy, who is the proprietor of the Drunken Clam in Quahog. Until Jerome accidentally kills him in a softball game, who then purchases the Drunken Clam and takes Horace's place to honor his legacy. Arthur: The Brain works part-time at his parents' ice cream shop, filling this role in later seasons. Sadie Miller in Steven Universe can be considered this for the Big Donut.